"Thanks for the use of your free utility. It worked as you said it would." Are you looking for a free SharePoint monitoring tool that tracks changes and data access? The free edition of Netwrix Auditor for SharePoint enables you to harden your SharePoint data security by keeping you current on changes to key SharePoint components, including the SharePoint farm, web applications, web pages, site collections, sites and user content, as well as document reads. This SharePoint monitoring tool collects and analyzes information from the event logs produced by audited systems, and sends daily email reports with all key details, including the before and after values for changes, in a human-readable format, saving you time and effort while improving security. Gives you the before and after values for each modification, so you can quickly formulate the best response to unwanted changes. Reports on successful attempts to access data stored on your Microsoft SharePoint Server. Aggregates audit data from various sources, and sends a daily email summarizing all change and read events. Provides meaningful reports that make it easier to detect critical changes and troubleshoot SharePoint issues. Complements your SharePoint performance and SharePoint health monitoring solutions at no additional cost. Monitoring read access events and changes from the farm administrators group level down to single document permissions using native tools takes a lot of resources and time. The free edition of Netwrix Auditor for SharePoint will make your SharePoint monitoring and management routine more efficient by delivering actionable audit data in a timely and convenient manner. Lack of visibility into activity on your SharePoint Server increases the vulnerability of your critical collaboration services to both external and internal security threats. 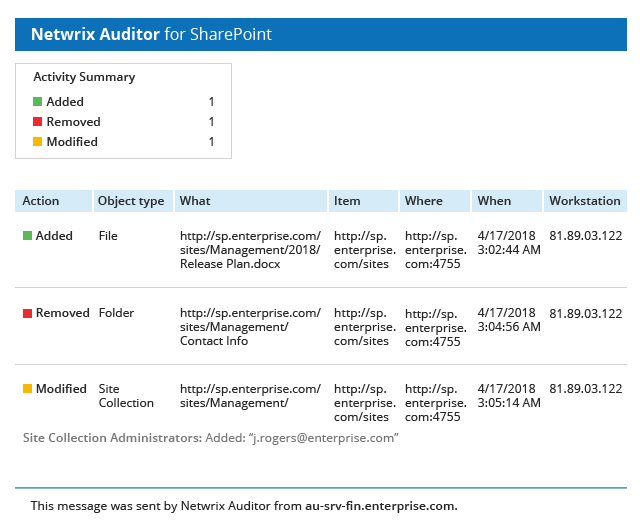 The free edition of Netwrix Auditor for SharePoint tracks all modifications and read events and sends you a daily summary. With this continuous SharePoint Server monitoring, you can detect users who have performed suspicious activity before it's too late. Instead of running PowerShell commands to view SharePoint reports and logs, quickly retrieve this information from the daily summaries. When you start using Netwrix Auditor for SharePoint, you get full functionality for free for 20 days. After that, you can either activate the Free Community Edition or apply a commercial license that enables you to continue using all of Netwrix Auditor’s features. The table below highlights the differences between our free SharePoint monitoring tool and the standard edition of Netwrix Auditor. Netwrix Auditor for SharePoint is easy to deploy and manage. Check out the table below to make sure your IT environment meets the minimum system requirements.